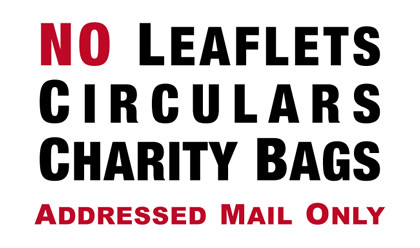 The 'Addressed Mail Only' sticker has been designed to stop any type of unaddressed junk mail, including charity bags. You'll get a white No Cold Callers doorbell sticker with each sticker you buy, for free (so, if you buy two letterbox stickers you'll get two doorbell stickers). If you prefer a red 'No Cold Callers' sticker or if you don't want the free sticker, just let me know by entering a note in the Paypal checkout or by contacting me. Of course you'll still need to sign up to Royal Mail's Door-to-Door Opt-Out if you also want to stop leaflets delivered by the postman (because Royal Mail has a policy of ignoring any type of 'No Junk Mail' sign).